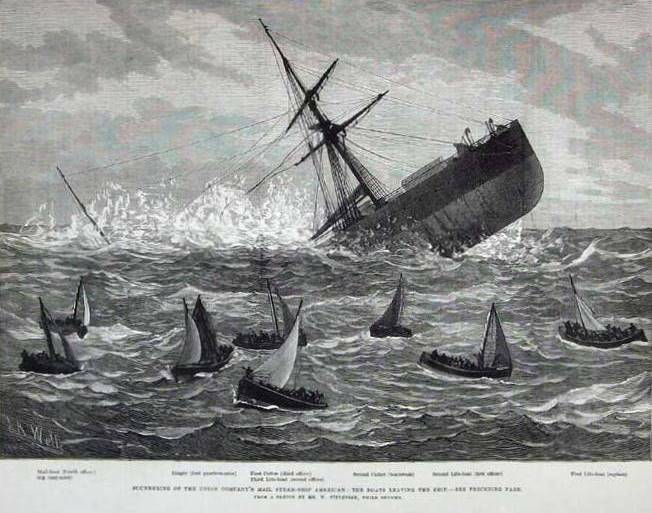 On April 23rd, 1880, at 5:00, while on voyage from Southampton to Cape Of Good Hope with 1750 tons of general cargo and 68 passengers, AMERICAN sprang a leak, 200 miles southwest of Cape Palmas and sank at 12:00. The AMERICAN had a suffered a broken propellor shaft and the pumps were not able to keep the water from rising. All crew and passengers went for the 8 boats. Three of the boats were picked up by the liner CONGO on her way home, on 25 April and these survivors were landed at Madeira on 8 May. Three other boats were found by the American vessel EMMA F. HERRIMAN and were transferred to the steamer COANZA, which landed them at Grand Bassa, Liberia. 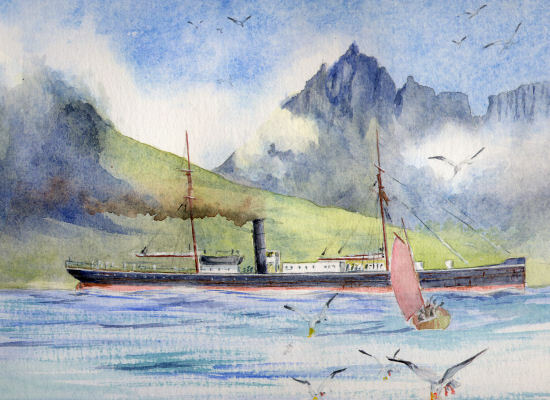 They were then taken on board steamer SENEGAL which sailed for Las Palmas, but on 15 May, the SENEGAL ran aground off the coast with one casualty. Finally, SS TEUTON took these passengers to Cape Town. It was only on 28 May that news came of one of the remaining two missing boats from the AMERICAN. The occupants had been picked up by a German schooner MOLTKE, transferred to the steamer KAMERUN and then landed at Madeira. When almost all hope had been abandoned of the seven crew members who were in the last remaining boat. But they were miraculously found by the Portuguese ship, TARUJO, four months after the first news of the disaster had reached England, and landed at Loanda on 21 July. AMERICAN was built in 1873 by Alex. Stephen & Sons at Linthouse, Glasgow with a tonnage of 2126grt, a length of 320ft, a beam of 34ft 2in and a service speed of 12 knots. American was one of five mail steamers brought out by the Union Company in 1973 as a result of the opposition commenced by Currie’s Line. Her handsome appearance was spoiled in 1876 when she was fitted with a long poop. She met her end in 1880 through the breaking of the propellor shaft. ......................on board the American while Captain Wait was relaxed as he steamed south convinced that the American would maintain its record for the fastest time from Southampton to South Africa and the passengers anticipated the traditional fun associated with the crossing of the equator the next day. But at 5 o’clock in the morning on April 23rd at 1.52º N by 9.50º W, off the Coast of Liberia, West Africa there was a sudden and indescribable shock under the stern of the ship. First Engineer Trottman quickly ascertained that the main propeller shaft had broken and its wild gyrations had fractured the ship’s bottom. The crew were assembled on deck and ordered to prepare the lifeboats for abandoning ship. The meal of beef, sausages, biscuits and lobsters prepared for breakfast by Chief Steward Royal’s department was quickly transferred to the lifeboats. At 8 am. Captain Wait gave the order to disembark. In this picture John Henry Royal in steward's uniform is seated in the middle. The thirty women and children were first handed down to the eight boats that had been assembled. The rest of the passengers and crew followed them. Captain Wait was the last to descend the now sloping ship’s side as they all pulled away on the calm sea to watch the American go down stern first six hour later. Sails were raised and orders were given to stay together and steer for the nearest land at Cape Palmas on the Ivory Coast 250 miles away. The three fastest boats out-sailed the others in a rainstorm and three days later at 6am, the British and African liner SS Congo picked up 50 passengers and crew who had been missed by the passing SS Balmoral Castle. The Congo set course for Madeira after a fruitless search for other survivors. All the remaining boats had now become separated but on the moonlit night of April 29th the lifeboat with Captain Wait and Chief Steward Royal aboard was picked up by the barque Emma F. Herriman, a five-masted sailboat of US registry and trading in palm oil and hides. Later, two more lifeboats were sighted and 65 weary survivors were crammed into the small, evil smelling space on deck. Captain Upton of the Herriman sailed close to shore and sighted the SS Coanza which on May 7th took the exhausted souls to Grand Bassa in Liberia where after a dinner and dance with the Governor the ill-fated British and African Liner SS Senegal took them to Sierra Leone. On May 12th. en route to Las Palmas, Grand Canary, the Senegal hit a rock 12 miles out. Captain Keene ordered full speed ahead to beach the ship before she sank but when the boats were lowered there was a general panic and rescued American passenger, the Honourable S. Paterson, Member of the South African Assembly was caught in the churning propeller and never seen again. The bedraggled passengers and sailors spent the night on the beach then took mules overland to Las Palmas where the SS Teuton transported them to Madeira for the SS Nyanza to take them on the final leg back home to Southampton. Of the two remaining American lifeboats the German Schooner Moltke picked up one after seven days. The last, the dinghy captained by the quartermaster, was not found until mid July when its occupants were taken on board the Portuguese brig Tarujo. Later transferred to HMS Dwarf they finally arrived at Cape Town on July 21st. In all, 39 vessels from canoes to liners were involved in the search for survivors of the stricken American. A later enquiry stated, “The Captain, officers and men deserve great credit for the way in which in their several stations they did everything they could to save the ship and the lives of the passengers”. The Union Line honoured Captain A. McLean Wait and in 1893 he became Marine Superintendent in Southampton after serving on six other Union ships. Following the amalgamation of the Union and Currie lines into Union-Castle he was assigned to run their New York office where he died in 1907 at the age of sixty.